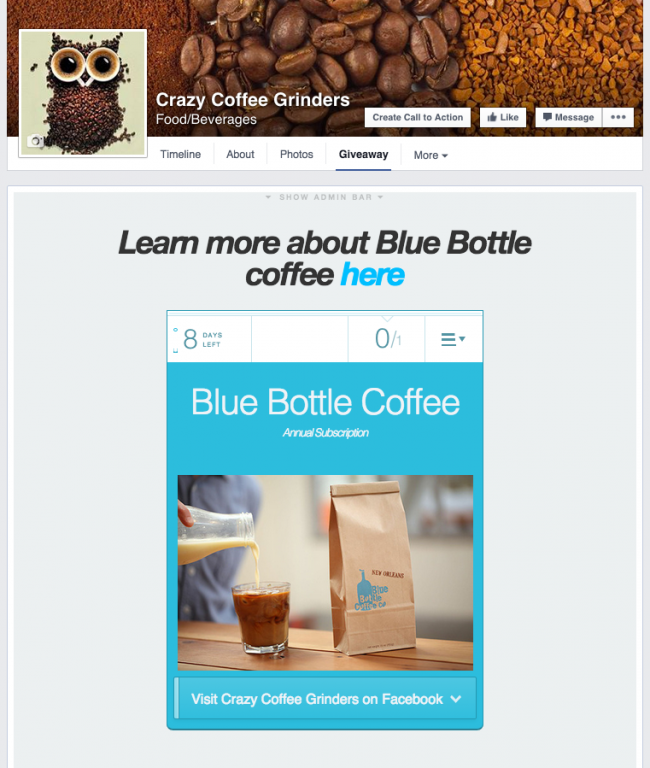 Are You Using Facebook Entry Options Correctly? Rafflecopter PSA: if you’re running a Facebook giveaway with the entry option “visit us on Facebook”, you may want to reconsider. Although it may seem counterintuitive, sometimes the best thing you can do to optimize your giveaway on Facebook is to not include an entry option for Facebook. Sounds crazy, right? I’ll explain. I hear ya, but if you’re only hosting your giveaway on Facebook, people are already navigating to your Facebook page to enter your giveaway. …the same fan page they were just on. Do you see how that’s a strange experience? 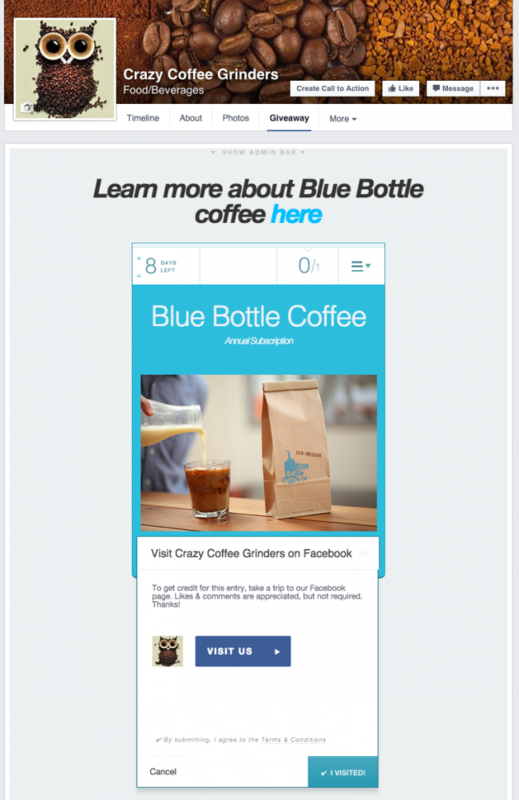 You’re not actually sending traffic to your fan page, you’re sending your traffic in a loop. All promotional mentions (tweets, Facebook posts, etc.) of your giveaway will point to the giveaway tab on your Facebook. If people are interested in your business, trust me, they will poke around your page. No! I’m just saying the “visit us” entry option was created for giveaways hosted in places other than your Facebook page: company websites, blogs, etc. Actually, the “visit us” entry option is a great way to convert website traffic into social traffic. So, if you’re hosting a giveaway on your website, but would like to start building up your Facebook following, this entry option is perfect for directing traffic. In fact, it’s our most popular entry option. Another use for this entry option is group giveaways on Facebook. If you’re hosting a giveaway with several other blogs and/or brands, you can host the giveaway on your Facebook page and ask entrants to visit the other brands’ Facebook pages. Since you already have Facebook traffic covered by hosting the giveaway on your Facebook page, it’s worth considering your other marketing goals. Could you use some more traffic to the giveaway? If so, consider using the “tweet a message” entry option. This is an easy way to amplify your reach to your entrants’ contacts, and you don’t even have to have your own Twitter account. Maybe you’d like product feedback or extra demographic information about your customers. Use the poll entry option. What about growing your mailing list? It’s an easy entry option with a lot of marketing power. 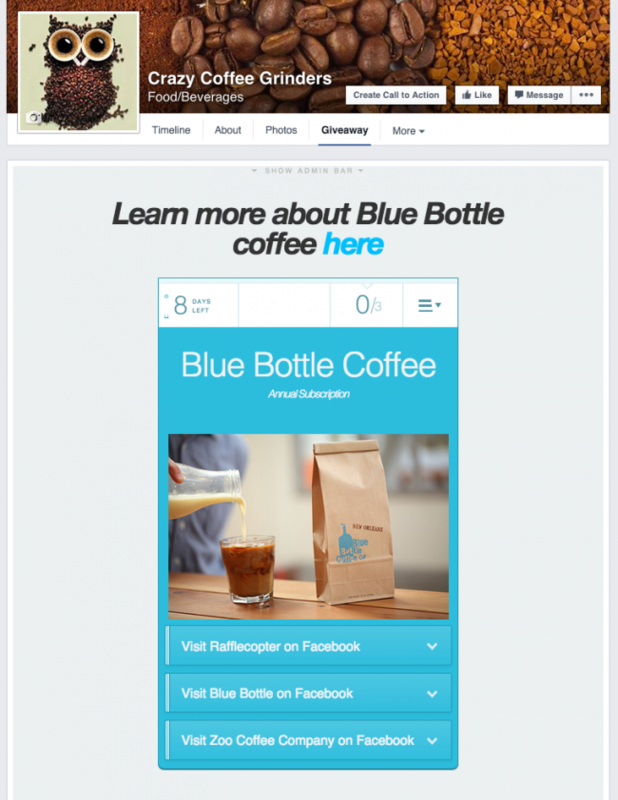 The “visit us” entry option is an effective entry option for driving traffic to your Facebook page— unless the entrant is already on your Facebook page. Don’t send your entrants in circles! Other entry options will provide more value to your Facebook giveaway by increasing your reach and providing a better user experience for your fans. 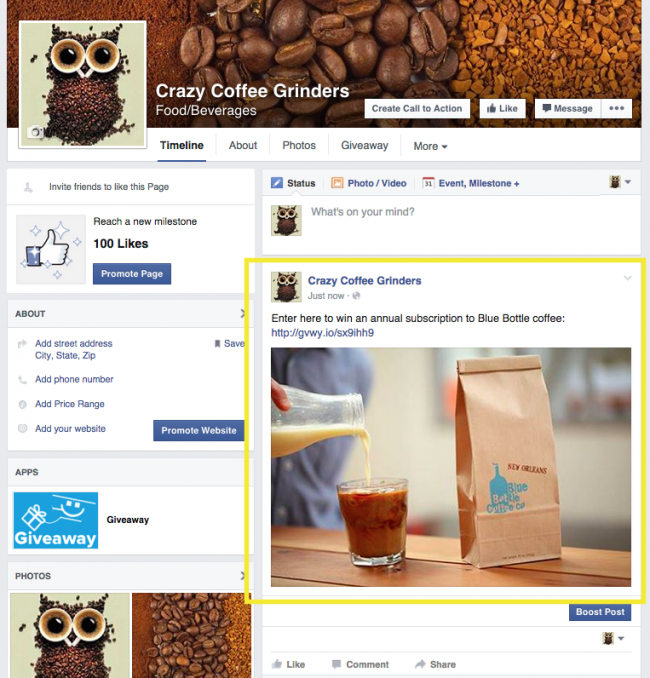 For other Facebook giveaway tips, check out our Field Manual and Knowledge Base articles. In my opinion, the “View my Facebook page” entry method doesn’t offer much value and I don’t use it anymore. I’ve found that many users will only complete that entry and nothing else (follow on Twitter, subscribe, etc.). In other words, they toss their name in the hat and walk away. 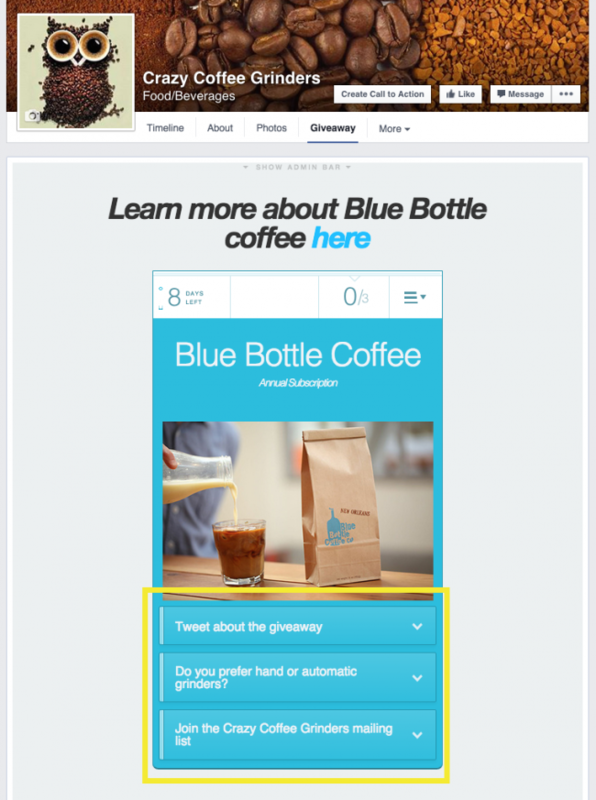 Just viewing the page is essentially saying “click to enter” and the user will almost never like the FB page or interact with a post. Thanks Seth. This is exactly what happened with my Giveaway. I had a handful of likes on the image of the product, but they did not like my page and interesting enough,as far as I can tell, none of my followers entered the Giveaway or liked the Giveaway that was mentioned at least 3 times. I wonder why???. Hey Elaine, have you seen our Field Manual? It has some great promotion tips around prize selection and entry options. Also, you’ll want to make sure you’re using our mobile friendly share link in your timeline, so mobile users can enter your giveaway. Email us at support@rafflecopter.com if you have any questions! Thanks for the comment! Yes, Facebook has certainly made it more difficult to recruit likes since they updated their terms and conditions. We’re working on improving this feature for better conversions, so stay tuned! Thank you Brittany. It makes sense not to send your followers in circles. I’ll experiment with other entry options in my next Giveaway.